The advice below will help you maintain Limestone to a good standard however please note Limestone is a sedimentary stone as such it’s generally very porous and acid sensitive, as such it can be damaged through the use of even mildly acidic soaps, shampoos and body washes and as a result is not recommended for use in wet rooms, shower cubicles or near swimming pools. If you have the use of a 150 RPM (or slightly higher) buffing machine restore the honed finish by burnishing the floor using a No.1 Red burishing pad to take off the old sealer and ground in dirt, add water to the area and then go over each tile with the pad 3 or 4 times, then remove the dirty water using a wet vax and rinse the floor. Next take off the coarse pad and apply a No2 Blue burnishing pad and repeat the process followed by the No.3 Yellow burnishing pad. Again remove the water with a wet Vax machine and then scrub the grout joints with Pro-Clean diluted 1:5 parts water. Leave to fully dry and then complete by applying a No. 4 Green burnishing pad and polish with a squirt of water. When fully polished protect the floor by applying a sealer as per instructions below. Alternatively spray undiluted Tile Doctor Remove and Go onto the stone (use as directed), leave to dwell for ten to fifteen minutes (if necessary add more product to prevent it drying out) then agitate with a scrub brush or a black buffing pad fitted to a buffing machine. Add water as you go to lubricate the process and then use a wet Vax to extract the soiled solution from the floor. Rinse thoroughly with clean water to make sure the floor is neutralised of any chemicals. In normal circumstances allow 24 hours for the stone to dry out before sealing, a damp meter can be used to verify when the stone is dry. 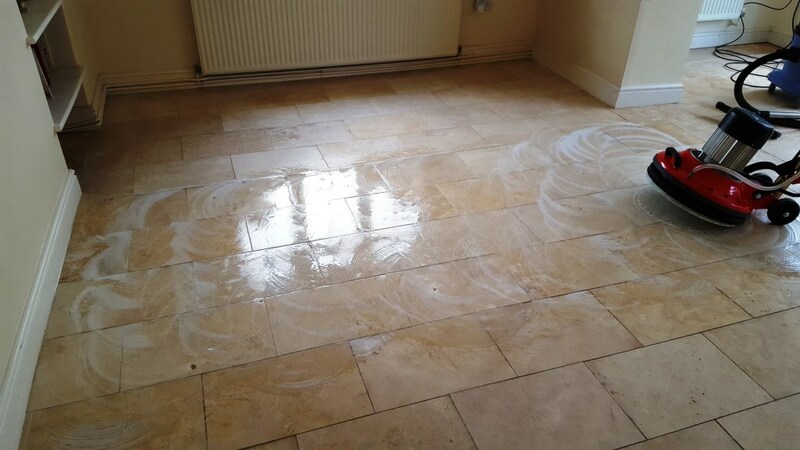 The best way to clean and polish Limestone wall tiles is with a hand-held polishing machine using a set of six inch Burnishing pads, we find using chemicals less effective on vertical surfaces and can lead to staining. The process is thus, spray the No.1 Red Burnishing pad with water then apply to the wall tile until the dirt and old sealer had been removed. Then switch to a No.2 Blue Burnishing pad and repeat the process followed by a No. 3 Yellow Burnishing pad straight after. This method is also the best way to treat the build-up of Limescale as the acidic cleaners commonly available for this will actually damage the Limestone. If the grout is in need of attention then clean the grout at this point using Tile Doctor Duo Clean which is a very effective grout cleaning product as well as treating mould. Make sure to thoroughly rinse the tiles after using Duo Clean to remove any trace of chemicals otherwise it may impact the sealer when it is applied. Leave to dry overnight and then finish with a No. 4 Green Burnishing pad until a nice light sheen has been achieved, this will tighten up the pores of the Limestone thus making it easier to seal and maintain. See below for sealing instructions. Black Limestone can lose its colour and look washed out over time or if the wrong products have been applied; to get the colour back you can apply Tile Doctor Stone Oil. For more information about cleaning and maintaining Black Limestone please visit our dedicated Black Limestone maintenance page. When the tiles are fully dry apply either one coat of Tile Doctor Colour Grow to enhance the natural colours of darker Limestone’s. If however you area sealing a white or off-white Limestone and you not wish to darken the stone apply a single coat of Tile Doctor Ultra-Seal which provides a natural look finish. Please note a second coat of sealer may be required if the stone is very porous.For architecturally specified sealers we recommend Tile Doctor Pro-Seal which is a water based impregnating sealer suitable for all types of honed stone including Limestone. For regular cleaning use a sealer friendly cleaning product such as Tile Doctor Stone Soap which has been especially formulated for the regular cleaning of Sealed Stone and Tile surfaces keeping them fresh. If you have applied a burnishing pad system it makes it much easier to keep these tiles clean by using a No. 4 Green burnishing pad on the stone every two to three months depending on wear. This process will improve surface tension (which is not to be confused with the amount of sealer residing in the stone), thereby tightening the pores in the stone to improve the overall appearance and finish of the floor. Set of four 6 inch worktop pads, everything you need to restore polished Granite and Marble worktops. Set of four 17 inch floor burnishing pads, everything you need to to restore polished stone floors.